Shawna is a natural-born teacher, her presentations are engaging, entertaining and highly informative. She is able to take complex scientific information and explain it in a way that everyone can easily understand. Her passion and enthusiasm for natural health is evident as she draws from over 20 years of experience in nutrition, science, organic farming, holistic health, and sustainability. *Please contact Shawna for your specific event. If you are a non-profit please let us know and we can discuss a complimentary rate. 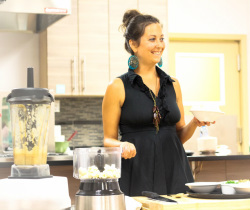 Raw Food Chef Certification - Living on Live Food Program. More info on Events Page.